if you are not completely satisfied, for any reason, within 30 calendar days of purchase, we will give you a full refund. You can easily purchase our products online. We accept Visa, MasterCard, JCB and Diners. Our products use license key activation to unlock the trial version. The product can be activated at anytime during or after the 20 day trial. If you decide to purchase a license you will receive an email with your registration information and one or more license keys that will unlock the product. Please follow the steps below to activate your product. In this example we will activate the VistaSkin component, At design-time open the main form where the component is placed. Click on the component in the component tray and select the Register designer task. 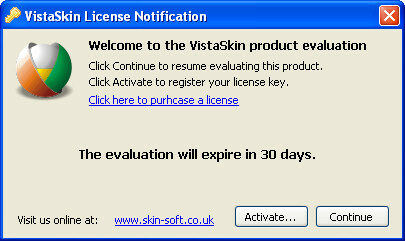 You will see the License Notification dialog, Click on the Activate button. Enter the registration information and license key that was sent to you after purchasing a license. The name and company must match the name and company we received during the order process (note this is not case sensitive). Click OK to finish the license activation. Your product is now permanently activated in the development environment if you upgrade your development computer or have to re-install visual studio then please repeat steps 1-3 to re-activate the product.